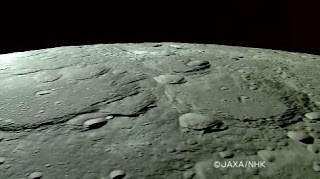 Almost one month after Japan's successful launch of the Kaguya lunar probe, the unmanned observatory has begun its first major activities in orbit around the moon. In addition to snapping its first lunar images, the probe jettisoned one of two 110-pound (50-kilogram) baby satellites that will help create a detailed gravity map of the moon. The major objectives of the Kaguya mission are to obtain scientific data of the lunar origin and evolution and to develop the robotics for the future lunar exploration. Kaguya consists of a main orbiting satellite at about 100km altitude and two small satellites (Relay Satellite and VRAD Satellite) in polar orbit.